Home / Tips and Info / Everyday Life / Haste Makes Waste! I hope you all had a very Merry Christmas this week! We have not yet celebrated as a family. Parts of my family were at our church’s Christmas Eve candlelight service however. The service was beautiful, and it was a blessing to celebrate this wonderful night with family. This is a rare year for us, as we are not all going to be able to get together at the same time. Some years we have our family Christmas on Thanksgiving weekend, just so we can all be together, but this year there just wasn’t any way of working it out. I guess that is what happens as everyone gets older. Most of us are gathering at our house this coming weekend, and I FINALLY have all of my shopping done! In addition to preparing for the coming weekend, I completed a new design that should be released in mid-January. I still need to write the instructions and photograph for the website and the packaging, and of course, play with the laser! I am really excited about this one, but am not ready to disclose its identity quite yet! I CAN tell you that it is NOT a bird. LOL. I also embroidered names on some stockings. We had kind of been on the fence about whether or not great-grands got stockings, and that definitely was not feeling right, so now the great-grands (and the new grand!) will have stockings. In order to make this work, we will no longer be hanging stocking for adults. Another price you pay for growing up, I guess. I have been determined to complete the week’s assignment for the Bonnie Hunter Mystery Quilt, “Good Fortune” each week before the next one comes out. I ALMOST made it this week… This week was a small black made of a half square triangle and two quarter square triangles. (If you want details, go to the Quiltville website and download the instructions. The instructions will only be on her site until the Mystery ends, so you might want to make sure you have downloaded all of the steps before then!) Of course, you make many of this one block. 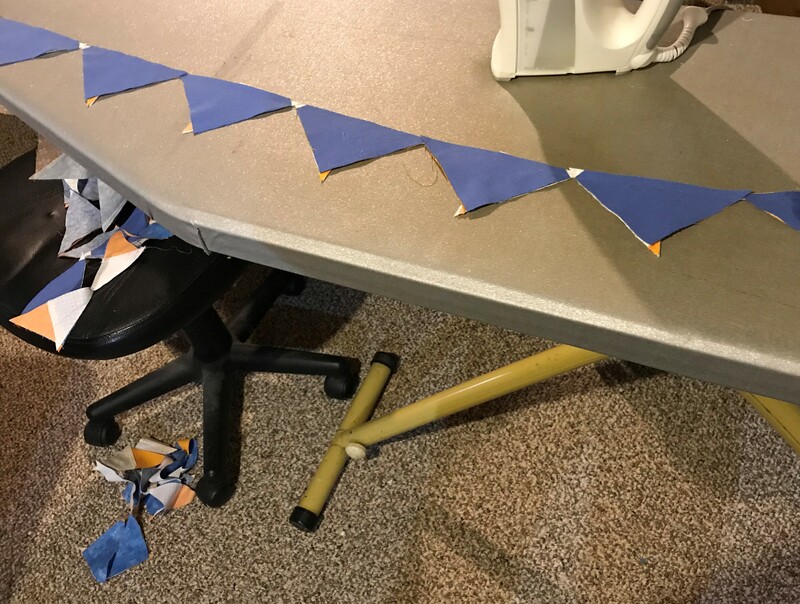 I chain stitched the quarter square triangles together, being very careful that the color placement was as directed. All were pressed to the dark side, and clipped apart. So far, so good. I then cut all of the half square triangles, and made a chain again, stitching them to the first unit. I am trying to keep this quilt very scrappy, so I took extra care to try to change up the blue with the different oranges, so that not too many blocks came out looking alike. I finished them all and gave them a good press. This was last night (Wednesday), and I was so happy to have gotten all of the blocks completed ahead of Friday! I decided not to clip off the bunny ears until after our Christmas get together, because I will have more “free” time then. (Whatever that is!) But I did have fun playing with the block so far, and trying to figure out how they will eventually all fit together, which is impossible, as we have many more to make. I must admit I was a bit disturbed when I read toward the end of this week’s instructions, “It’s about to get crazy around here in the Mystery department—anyone feel like they have boarded a freight train headed down hill without any brakes?”. I have kept up so far, and soon the house will go back to normal (whatever that is! ), so it will be fine, right? This morning I woke early, and went down to put the blocks in their basket and clean up. Of course the bunny ears were bugging me, so I dug out my appropriate fussy cut ruler to knock a few off, and guess what? I had hurried a bit too much and my center seams were ALL off! My machine has a scant quarter inch setting, and I am thinking I forgot to use it! All of the blocks are too small! Sooo… I “un”pressed all of the blocks, so that the two halves would be smooth after I rip them all apart. And they are now in a box waiting for me to sit down and rip out all of those blocks. And tomorrow morning the next clue comes out… (Big sigh!) My daddy always told me “Haste makes waste.” I guess I proved him right… again! Previous post: Video Tutorials are Now on the Website! Next post: “Good Fortune” is Revealed!